Go Rhinos: Not a Target, a photo by Davidap2009 on Flickr. Julien Masson of Artsim was keen to design something that was clean fun and good to look at but mindful of the plight of rhinos in the wild. 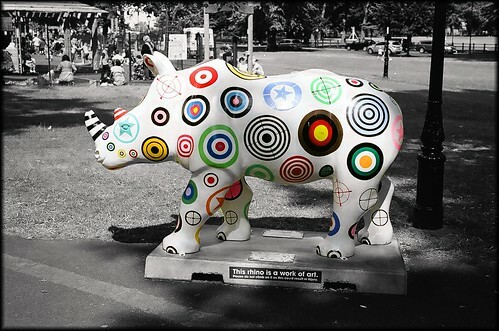 He chose the distinct patterns used for target practice and covered the rhino with them. “I like the idea of attracting but also repelling the beholder and hope it’s understood that I’m not trying to make a simple joke and that there is a serious subject matter behind this piece”. I thinks so to. It’s a wonderful project they have going.